Do Autoflowering Seeds Save Electricity? What Are The Real Advantages Of Autofem Plants? I’ve seen online seed stores advertising autoflowering/autofem seeds as “saving you electricity” during your grow. Is this true? Are these actually “more efficient plants?” or is this just more marketing jive to convince you to buy seeds that you cannot reproduce easily at home, assuring that you’ll buy more from the seed bank? 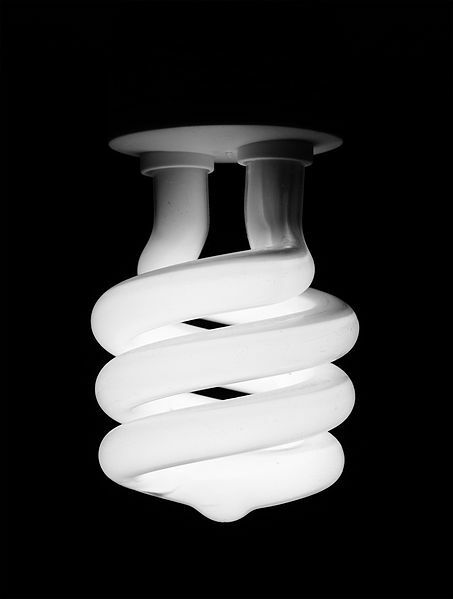 Let us look at the facts about the use of electricity during your grow. The math isn’t even complicated, and we don’t even need to know what you pay for electricity per kWH, since we’re talking about your grow location one way or another. We’ll assume that you want to grow a single plant, using 125 Watts of lighting – a typical small, personal medical marijuana home grow. On an early autumn walk, I found several cannabis ruderalis plants growing wild. To my surprise and delight, I found several seed-bearing plants and even one sinsemilla bud, which must have been upwind of the male plants I saw, already dried and dead, near the seed-carrying females up the road. The particularly cool part of the story is that the one larger, seedless bud had an amazing orange/pepper/cream aroma that I’d rank up there with some of the better sativa plants I’ve had the pleasure to sniff. Sadly, the whir of weed-whackers was not far behind me; a road crew was out for a late summer cleanup. I would have loved to let the beautiful sinsemilla bud mature, but I decided to pick her now in order to get some better pictures and a chance to sample the immature bud. I hurried ahead of the cutting crew and gathered seeds from the other female plants I could find. Hopefully a few of the couple dozen seeds I gathered will produce a plant with that amazing orange/pepper/cream aroma phenotype. In any case, they will serve as a great breeding platform for some autoflowering hybrids of my own. It will be great to have a ruderalis plant that already produces great aromas as stock to cross with other varieties (like my current favorite “Double Gum”) and see if I can cross-breed some heavier yielding autoflowering stock of my own. Perhaps these will become the “Panik Plants”? Wild Harvest Cannabis Ruderalis Smoke Report: Well, it isn’t fair to judge these plants based on the few wisps of bud I gathered in a hurry, but the good news is that they do produce a mild sativa-like effect. As is to be expected with a ruderalis (especially one with a few seeds on it) the smoke is a bit on the ropey side, but they do create a mild but pleasant head high. This is a very good start for a wild strain. If I can find that orange creamsicle pheno in the seeds I gathered, we may be onto something here. Writer Glenn Panik’s “How To Grow Cannabis At Home: A Guide To Indoor Medical Marijuana Growing”, is available on iTunes here, for the Amazon Kindle or via Smashwords here. You can also order the ‘stealth title’ of our information-packed ebook for the Kindle here. On cannabisgrowing.com, we’re focusing on tips for the budget-conscious grower who would like to still experience the distinctions between cannabis strains. There really are a variety of smells, tastes, and sensations that properly cured marijuana buds of different types have to offer. Here is a direct grow comparison between two inexpensive varieties from the respected cannabis seed bank “Sensi Seeds / White Label Seeds”. The two strains are Sensi’s “Afghan Kush”, and White Label’s “Double Gum”. At the point of publishing this article, the plants are just starting the 5th week of flowering, and we expect them to be done 3-4 more weeks (perhaps a bit longer for the Double Gum, from the looks of it). We want to show you how these two “budget” strains compare during the grow. We’ll give a “smoke report” later on. Sensi’s “Afghan Kush” costs $33 for 10 standard seeds, and the White Label Seeds “Double Gum” was just $19 for 10 standard seeds. 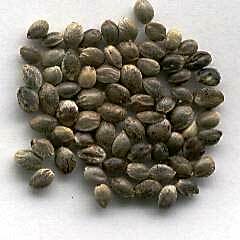 At just $2-3 per plant (we had 100% germination on these seeds) these are great for a budget grower’s home medicinal marijuana project. I wouldn’t, however, suggest these for your very first grow. The previous post (WSS Skunk Feminized) might be a better choice for a novice grower, and they are in the same price range. Now if you’re a beginning grower, you may be saying, “Huh? They don’t look different to me!” This is not unusual, so don’t worry. Let me point out a few things, then take a minute and compare them again – you’ll see what I am talking about. We’ll occasionally add some grow and smoke reports to the blog to fill you in on what goes on from seed to harvest, and what you can expect from a variety of strains available out there. This first Grow Report post is about the Weed Seed Shop Feminized Skunk seeds. This is a great plant for beginning growers, is very affordable ($30/24 Euros for 10 seeds! ), and is an excellent producer of potent marijuana buds. In fact, I’d recommend it to anyone – beginner or experienced – who likes a well balanced “Skunk”; the dried, cured buds have a balanced aroma of skunk/mint/pine, and one variant phenotype even produced a lemon/diesel smoke that was quite different from the others. More on that later. I am a dedicated soil grower, but have recently reaped the benefits of additional coco coir in the soil mix. The increased drainage and aeration has boosted growth rates, but requires somewhat more attention to keep the soil from drying out when using small containers (I prefer to run a small “sea of green” using one-gallon pots). For short term absences from the grow room, I need to be sure that the plants are getting enough water to hold out for a week, especially in the summer when the temperature – and the resulting transpiration of water – runs high. Recently, we were all going to be away for a week, and needed an easy solution to get the plants through with enough water to keep them moist, but without the danger of over-watering. The solution turned out to be quite inexpensive and very effective. I picked up a dozen “Blumat” – cleverly designed clay spikes with plastic caps and water tubing attached made by an Austrian company. They are simple to set up and use. Just soak the clay spike for about 15 min to saturate it with water. 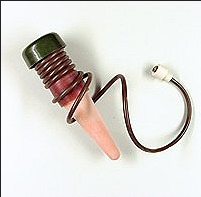 I found it useful to submerge the cap and tubing, as well, and get any air out of the tubes to be sure they work most efficiently. 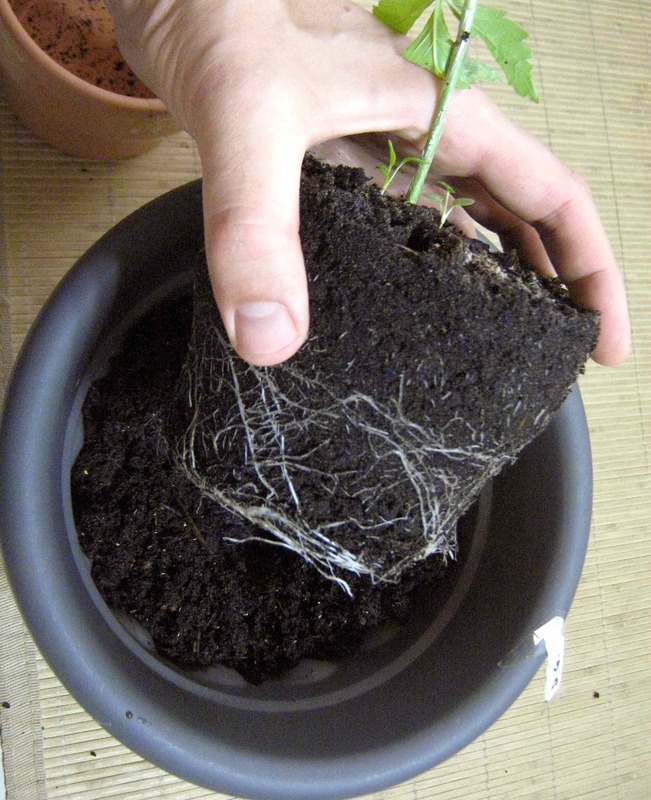 You then push the clay spike into your soil, and dangle the tubing into a reservoir of water that is placed lower than the clay spike. This is key! If you place the water bucket higher than the spikes, you’ll create a siphon and flood your plants. Keep the spikes above the water level, and they work using capillary action, drawing water up from the reservoir as the soil dries. It took a bit of trial and error ahead of time to get it set for our absence, but it turned out that two of these spikes per one-gallon pot kept the soil moisture just right under 250 Watts of lighting. I figure that most of you budget home growers are using 250 watts or less, in which case this setup should work just fine. Keep in mind that these “clay spikes” max out at 80-100ml of water per day, but will also deliver less if your plant requires less. They react to the dampness of the soil and draw accordingly. Not bad for a cheap, easy solution. You can pick them up in a pack of 3 on eBay or Amazon for about $12. OK, that’s a bit of an exaggeration, but there is a lot that can be accomplished with a soil mixture that is tailored to growing cannabis. One great thing about putting your soil mix together yourself is that it doesn’t cost much at all. In fact, if you want to go extra “green” you can recycle a few typical household “wastes” to become a potent fertilizer for your next grow. The first thing we need to consider is, “What would be the perfect soil for a cannabis plant?” Then all we need to do is put it together. Although feminized cannabis seeds have become very popular, many growers still prefer standard seeds. Feminized seeds tend to be develop plants that are rather consistent in their traits, but it is that genetic “roll of the dice” that can treat a grower of standard seeds to a prize plant to clone or save their own top-grade seeds. Saving pollen from a few killer strains – perhaps a resinous Afghani indica, a virile Thai sativa, and a fruit “Bubblegum” hybrid – lets you selectively pollinate a few buds on a particularly nice plant you have in flowering, and create a stash of your own special seeds. Cool stuff. For the budget-minded home grower, standard seeds are not only less expensive to begin with, but the option to save your own seeds saves much more money in the long run. So in this post contains a variety of tips to help you get the most from standard seeds. You’ll increase the chances of your plants growing into the desirable females for bud production, and also get a few males for pollen and save your own seeds.